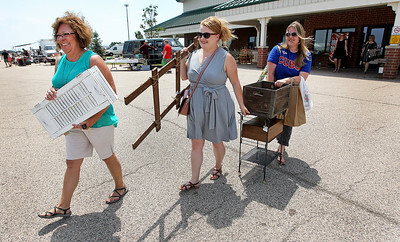 Candace H. Johnson-For Shaw Media Diane Wolanik, her daughter-in-law Jennifer, both of Crystal Lake, and Stephanie Knudson, of Lake Zurich head to their car with some items they bought at the Grayslake Antique & Vintage Market at the Lake County Fairgrounds in Grayslake. 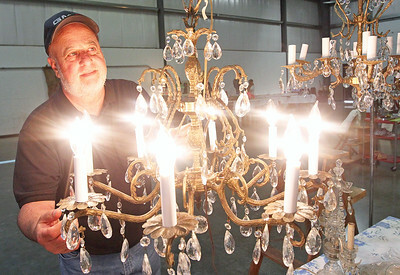 Candace H. Johnson-For Shaw Media Dan Constantino, of Grayslake looks at one of the chandeliers he had for sale at the Grayslake Antique & Vintage Market at the Lake County Fairgrounds in Grayslake. 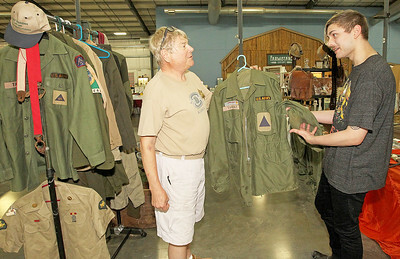 Candace H. Johnson-For Shaw Media Jim Tamraz, of Grayslake with Militaria, talks with Adrian-Thorvald Windsor, 21, of Winnetka about one of the of the U.S. Army jackets he had for sale from the 1960's during the Grayslake Antique & Vintage Market at the Lake County Fairgrounds in Grayslake. The military jacket belonged to Tamraz's father, John. 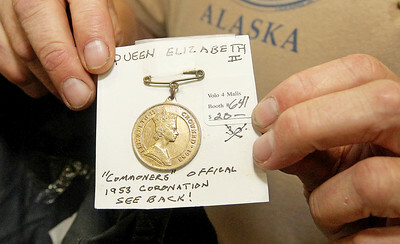 Candace H. Johnson-For Shaw Media Jim Tamraz, of Graylake with Militaria, holds up a Queen Elizabeth II "Commoners" Medal he had for sale at the Grayslake Antique & Vintage Market at the Lake County Fairgrounds in Grayslake. 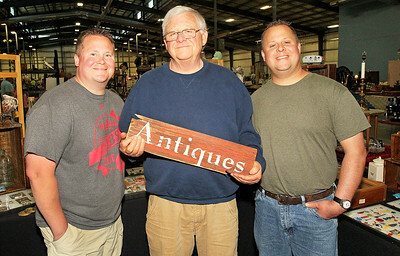 Candace H. Johnson-For Shaw Media Bob Zurko, owner of Zurko Promotions, (center) with his sons Adam and Tim at the Grayslake Antique & Vintage Market at the Lake County Fairgrounds in Grayslake. 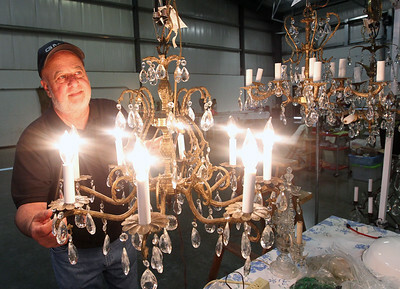 The Zurko family has put on the Grayslake Antique & Vintage Market since 2001. 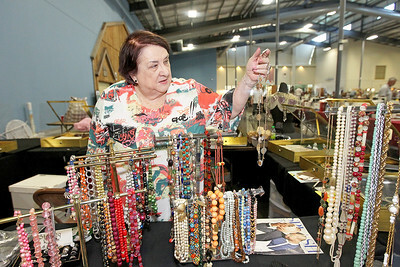 Candace H. Johnson-For Shaw Media Ellen Germanos, of Arlington Heights shows a necklace from one of her glass cases at the Grayslake Antique & Vintage Market at the Lake County Fairgrounds in Grayslake. 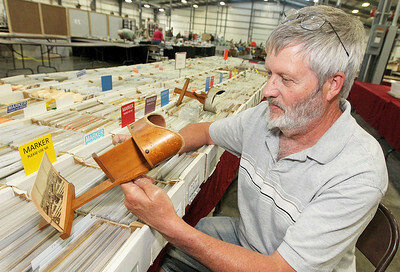 Candace H. Johnson-For Shaw Media Dean Kamin, of Elgin with Kamin's Moment in Time Antiques holds a wooden stereoviewer from the 1890's during the Grayslake Antique & Vintage Market at the Lake County Fairgrounds in Grayslake. The next Grayslake Antique Market will be on July 8th & 9th featuring the Postcard & Paper Show and Sale. Candace H. Johnson-For Shaw Media Large letter postcards from the 1950's were for offered for sale by Kamin's Moment in Time Antiques during the Grayslake Antique & Vintage Market at the Lake County Fairgrounds in Grayslake. The next Grayslake Antique Market will feature the Postcard & Paper Sale July 8th & 9th. 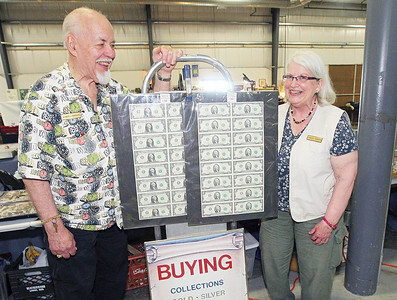 Candace H. Johnson-For Shaw Media Robert and Caren Hanson, of Richfield, Wis., with Numismatic Investments stand next to half sheets of one and two dollar bills they were selling at the Grayslake Antique & Vintage Market at the Lake County Fairgrounds in Grayslake. The Hanson's have been married for fifty-one years. 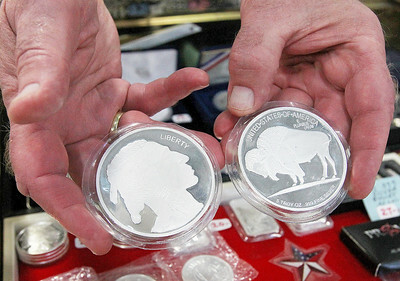 Candace H. Johnson-For Shaw Media Robert Hanson, of Richfield, Wis., with Numismatic Investments, shows a five-ounce pure silver Buffalo coin he has for sale as his wife, Caren, stands close by at the Grayslake Antique & Vintage Market at the Lake County Fairgrounds in Grayslake. 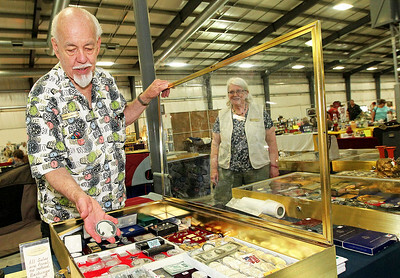 Candace H. Johnson-For Shaw Media Robert Hanson, of Richfield, Wis., with Numismatic Investments shows two five-ounce Buffalo coins he had for sale at the Grayslake Antique & Vintage Market at the Lake County Fairgrounds in Grayslake. 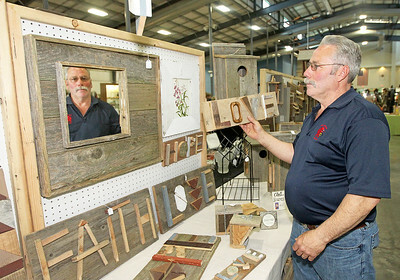 Candace H. Johnson-For Shaw Media Fergie Figueroa, of Ingleside with FF-Works looks to hang up a LOVE sign made from reclaimed wood during the Grayslake Antique & Vintage Market at the Lake County Fairgrounds in Grayslake. 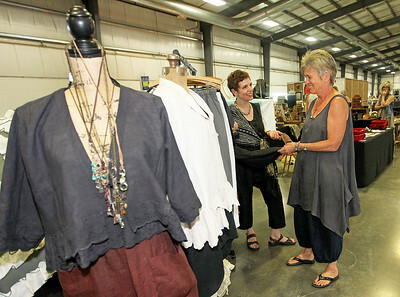 Candace H. Johnson-For Shaw Media Jane Tallman, of Wadsworth (on right) with Sunrags Studio shows Stacy Litow of Highland Park some clothes she was selling at the Grayslake Antique & Vintage Market at the Lake County Fairgrounds in Grayslake. 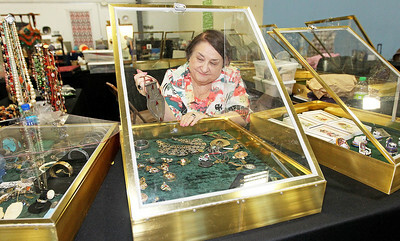 Candace H. Johnson-For Shaw Media Ellen Germanos, of Arlington Heights shows a necklace with medals on it she had in her collection at the Grayslake Antique & Vintage Market at the Lake County Fairgrounds in Grayslake. 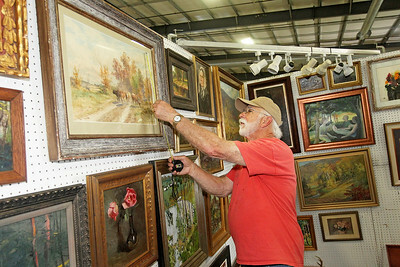 Candace H. Johnson-For Shaw Media Doug McEnroe, of Fennville, Mich., measures an original watercolor by artist Thomas Bigelow Craig in his booth at the Grayslake Antique & Vintage Market at the Lake County Fairgrounds in Grayslake. 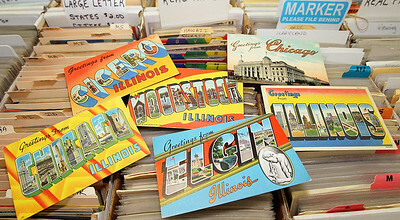 Large letter postcards from the 1950's were for offered for sale by Kamin's Moment in Time Antiques during the Grayslake Antique & Vintage Market at the Lake County Fairgrounds in Grayslake. The next Grayslake Antique Market will feature the Postcard & Paper Sale July 8th & 9th.